Sometimes, you just need red. And not just any red. Fire-engine red. 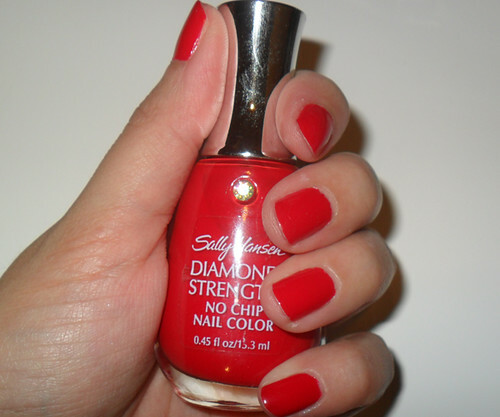 Or “Diamonds & Rubies” by Sally Hansen Diamond Strength. Sally Hansen is one of my favorite nail polish brands. Besides having my favorite Insta-Dry base and top coats, they have a good range of colors. Maybe not as many as O.P.I., but all the classics are there. And the best thing? The enamel is really tough with base and top coat. I find the opaque colors by Sally Hansen tend to last much longer than other brands. After 3 days (below), I usually have minimal chips and cracks, and the shine is still there. 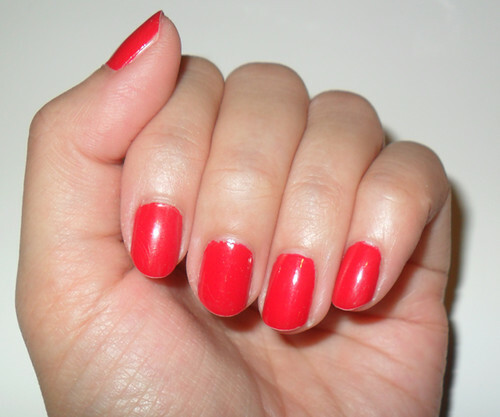 All you need then is another layer of top coat to bring out the shine once more, or if it has grown out at the cuticles or worn off at the tips, another layer of color.